determination in maintaining a fair judicial process. Chief justice Chan will retire on Nov 6,the day he turns 75. Mr Sundaresh Menon had a stellarlegal career in private practice before moving to public service. He has been described in law journals as "unquestionably Singapore's leading arbitrator". since its independence. He will succeed CJ Chan Sek Keong'61 who is retiring after six years in the job. Law alumni Adeline Ang, Lillian Wang and Suzanne Lim from the Class of ’96, have recently started an animal welfare group named, ‘Three Legs Good’. The group helps to find good homes and rehabilitate dogs that have lost their limbs to road accidents or illegal traps. Justice Steven Chong, SC ’82, is currently a Judge of Appeal and will take over as Singapore Attorney-General on 25 June, 2012, succeeding Mr Sundaresh Menon. Justice Chong has been a High Court Judge for 3 years. Mr Menon, SC ’86, will be appointed as Judge of Appeal from 1 August, 2012. Seow Tzi Yang’11, top student from the National University of Singapore’s Faculty of Law, donated his prize money of the Chief Justice Prize that he had received back to his alma mater. This was an interview with Sugene Gan, also known as Genie, who just graduated from NUS Faculty of Law. She has just started working with a law firm this month and said that while she might not end up becoming famous or rich lawyer, she wants to be a good lawyer, Genie launched her first music album in 2005, and she has Accountancy and Psychology qualifications. Out of her love for music, she also started a music school. Sugene Gan, Class of 2011, shares her talents with the needy and the community. Through her latest album, Dreams and Awakenings, Sugene aims to raise funds for HCA Hospice Care. The blogger-singer is also an environmental advocate. This latest album was released in a thumb-drive to save materials. Through her start-up, Genie Sound Advice, she has also helped people with public speaking and vocal training. NUS Faculty of Law congratulates our alumni Mr Ong Keng Yong’79 on his appointment as High Commissioner to Malaysia. NUS Faculty of Law congratulates our alumni, Mr Roderick Edward Martin ’71 on his appointment as Senior Counsel in January 2011. The Faculty of Law congratulates our alumna Ms Debby Lim Hui Li ’06 for winning the Christopher Bathurst Essay Prize and also extends its congratulations to the runner-up, Mr Mahesh Rai ’08. The Christopher Bathurst Essay Prize, named in honour of the late Christopher Bathurst QC (Viscount Bledisloe QC), a senior member of Fountain Court Chambers for many years who often practiced in Singapore, was open to full-time students enrolled in undergraduate, graduate, or doctoral studies in Law at the National University of Singapore Faculty of Law, and the Singapore Management University School of Law, as well as Qualified Persons under the Legal Profession Act under the age of 30. Ms Rachel Eng '91 is the first woman managing partner of a Big Four law firm in Singapore. The Honourable the Chief Justice Chan Sek Keong was conferred an Honorary Doctor of Laws (LL.D.) by the National University of Singapore (NUS) during the first session of its 2010 Commencement ceremony. This was to recognise his leadership of the country's judiciary and contributions to Singapore's criminal justice system. Chief Justice Chan was from the pioneer batch of graduates from the Faculty of Law in 1961. The Faculty of Law congratulates our alumni, Dr Philip Pillai ’71 (a member of the Faculty’s Advisory Board), Mr Quentin Loh ’74, and Mr Steven Chong ’82 (also a member of the Faculty’s Advisory Board) on their appointments as High Court Judges. Mr Sundaresh Menon, SC '86, currently managing partner of Rajah & Tann, will take over as Singapore Attorney-General in October 2010. Mr Menon graduated from National University of Singapore with first-class honours and later obtained a master’s degree from Harvard Law School. Regarded as one of the world’s top arbitrators, he is currently deputy chairman of the Singapore International Arbitration Centre and is a member of the Senate of the Singapore Academy of Law. NUS Faculty of Law congratulates our advisory board member, Mr George Lim Teong Jin ’81 on his appointment as Senior Counsel in January 2010. NUS Law congratulates our alumni who have been appointed Senior Counsel in January 2009 - Jeffrey Chan '73, David Chong '83, Francis Xavier '88 and Ang Cheng Hock '95. Ms Chew Gek Khim was appointed as Chairman of the National Environment Agency four months ago. She is the granddaughter of local pioneer banker Tan Chin Tuan and graduated from National University of Singapore (NUS) Law Faculty. The two recipients of the Lee Kuan Yew Scholarship Award were featured. One of them is Mr Vincent Leow, who is a senior associate with Allen and Gledhill and an adjunct tutor at the National University of Singapore. He also serves on the Board of Directors of Heartware Network. This story was reported in The Straits Times (Home Page B3) and 938 Live (13 Aug 08). It was reported that NUS law graduate Chok Kerong received the National Arts Council (NAC) Arts Overseas Scholarship to study at the Manhattan School of Music in New York. He is the only jazz musician here thus far to have clinched it. During his undergraduate days, he juggled his law classes with performances at the Esplanade Mosaic Music Festival, the Chijmes Jazz Festival and various jazz clubs; he also recorded albums for artistes and penned original compositions. Last year, another NUS law graduate had won the NAC Arts Overseas Bursary to pursue a two-year Masters in Jazz Performance degree at New York University. Koh Juat Jong will leave her role as Registrar of the Supreme Court and take over from Walter Woon, who is the new Attorney-General. Court of Appeal president Datuk Abdul Hamid has been appointed Chief Justice of Malaysia, the highest judicial post in Malaysia. Federal Court judge Tan Sri Zaki Tun Azmi will take over from Chief Justice Abdul Hamid as Court of Appeal president. Chief Justice Abdul Hamid graduated from the Faculty of Law of the then University of Singapore in 1969 and joined the judicial and legal service as magistrate in Kangar, Perlis that same year. He was appointed High Court judge in March 1992 and appointed to the Court of Appeal eight years later. On July 24, 2003, he was appointed a Federal Court judge and subsequently, appointed as Court of Appeal president in August this year. He has been bestowed several state honours and awards, including the Datuk Paduka Cura SiManja Kini (DPCM) by the Perak government and the Darjah Yang Mulia Pangkuan Negeri (DMPN) by the Penang government. NUS Law alumnus Lucien Wong ’78 was conferred a Special Award at the Chambers Global Awards 2007 event in London. The Special Award was one of only two Awards conferred on individuals for their contributions to the legal fraternity. He is notably the first local lawyer to be honoured at this annual global awards ceremony for lawyers. joint top of his graduating class with a Bachelor of Laws (Honours) degree in 1978. Lucien was admitted as an Advocate and Solicitor of the Supreme Court of Singapore in 1978 and has been in legal practice since that time. He joined Allen & Gledhill as a partner in 1987 and has been Managing Partner of Allen & Gledhill since 1998. He specialises in banking, corporate and financial services work. Federal Court judge Datuk Abdul Hamid has been appointed Court of Appeal president, the second highest judicial post in Malaysia. Judge Hamid graduated from the Faculty of Law of the then University of Singapore in 1969 and joined the judicial and legal service as magistrate in Kangar, Perlis that same year. He has held various posts in the service, including Kuala Kubu Baru Sessions Court president, Kedah/Perlis Legal Aid Bureau assistant director, deputy registrar of the High Court of Malaya and legal adviser of Kelantan and Perak. Judge Hamid was appointed a judicial commissioner on May 1, 1990 and appointed a High Court judge in March 1992. Eight years later, he was appointed to the Court of Appeal. Judge Hamid was appointed a Federal Court judge on July 24, 2003. On April 1 this year, he was appointed a judge to the Special Court set up to hear cases involving rulers and members of royal families. Judge Hamid is married to Datin Hamidah Chong Abdullah, and the couple has four children. Judge Hamid had also written more than 550 judgments in the High Court, Court of Appeal and Federal Court. NUS Faculty of Law congratulates our alumnus, Professor Dr Cheong May Fong (LLM ’89) on her appointment as Dean of the University of Malaya Faculty of Law. She succeeds Professor Khaw Lake Tee who will be appointed a Deputy Vice-Chancellor. Professor Dr Cheong May Fong obtained her Masters of Law from the National University of Singapore in 1989 and completed her Doctor of Philosophy at the University of Sydney in 1999. Professor Cheong specialises in the Law of Contract, Remedies, Unfair Contracts and Consumer and Competition Law. Her current research interests include Advanced Issues in Contract Law and Specific Remedies. 19 April 2007 – The Faculty of Law’s Professor Koh Kheng Lian ’61 became the first female faculty member in the history of the National University of Singapore (NUS) and its predecessor institutions to be conferred the title of Emeritus professor. She is only the second in the Faculty to receive this honour, which is bestowed in recognition of the recipient’s distinguished scholarship and outstanding service to the University. Professor Koh’s leadership at the Asia-Pacific Centre for Environmental Law (APCEL) launched NUS onto the world stage as a leading centre for environmental law. The centre now features as the region’s premier establishment for research on and the teaching of international environmental law. A member of the Faculty of Law since 1963, Professor Koh introduced environmental law to the Faculty in 1994, and also actively promoted the development of environmental law courses for both public and private sectors in Singapore. Additionally, she has made significant contributions to the field of criminal law and specific areas of law such as Straits in International Navigation and Credit and Security in Singapore. Professor Koh’s aspiration is to continue working towards ensuring that APCEL, as a steward of the environment, will devote its utmost efforts to changing mindsets. "I cannot emphasize enough the importance of environmental protection in light of global warming, zoonotic diseases, as well as loss of biodiversity and ecosystems which are beginning to impact on mankind" – Emeritus Professor Koh Kheng Lian ’61. Justice Rajah graduated from the National University of Singapore in 1982 and obtained his Masters of Law from the University of Cambridge in 1986. He was a member of the winning Jessup Moot team in 1982, and was among the first batch of lawyers in Singapore to be appointed Senior Counsel in 1997. Justice Rajah is married to fellow law school alumnus Vathani '88, and they have 2 daughters, Meera and Maya. Justice Rajah now joins Chief Justice Chan Sek Keong '61 and his classmate Justice Andrew Phang '82 on the Court of Appeal. At their 20th anniversary class reunion on 19th August 2006, the NUS Law School Class of 1986 has generously established a fund to provide scholarships for needy law students. To date, members from the Class of 1986 have pledged a sum in excess of $100,000 for the fund, which will be named the Class of ’86 Bennett Lam Scholarship Fund in memory of their late classmate, Bennett Lam. The generous donation from the Class of 1986 is an important step towards our aim of ensuring that no capable student is deprived of an NUS law school education by virtue of being unable to afford the fees. We would like to place on record our gratitude to our alumni from the Class of 1986 for their generosity and continued support. We also join them in celebrating the life of Bennett Lam '86. Attorney-General Chan Sek Keong '61 is the first NUS Faculty of Law graduate to be appointed Chief Justice. He was sworn in by President S R Nathan on 11 April 2006 following the retirement of Chief Justice Yong Pung How LLD '01. The Attorney-General was among the inaugural batch of 22 graduates from the then University of Malaya, the predecessor of the National University of Singapore. Two other Law Faculty alumni have also been appointed to the Bench - Mr Lee Seiu Kein '86 and Mr Sundaresh Menon '86. They join Judge Andrew Phang Boon Leong '82, who was appointed Judge of Appeal earlier this year. SINGAPORE'S Ambassador at Large Professor Tommy Koh ’61 was named as one of seven Champions of the Earth by the United Nations Environment Programme (UNEP). The awards recognise prominent and inspirational environmental leaders from each region of the world. Prof Koh was honoured for his significant contributions to the protection of the environment by chairing the Earth Summit and the UN Conference on the Law of the Sea. Prof Koh is the patron of The Nature Society, Co-Chairman of the NUS Faculty of Law’s Asia-Pacific Centre for Environmental Law and Chairman of the Advisory Committee of the Masters degree on Environment Management at the NUS School of Design & Environment. Dr Andrew Phang Boon Leong S.C. '82 has been appointed by President Nathan as a Judge of Appeal from Tuesday, 28 February 2006. Dr Phang, 48, is well remembered as a student and a teacher at the Faculty. He graduated from the Faculty in 1982 and taught here for 18 years. Former Supreme Court Judge Mr Lai Kew Chai passed away peacefully on 27 February 2006. The Law School is saddened by his passing. Mr Lai Kew Chai is fondly remembered by all at the Faculty. He read law at the then University of Singapore and was the Editor of Me Judice the predecessor of the current Singapore Law Review. Following his graduation from the Faculty of Law in 1966 he quickly distinguished himself as a lawyer at Lee & Lee but continued to maintain his ties with the Faculty as a part-time tutor in the Faculty during the 1970s and was External Examiner for sessions 1981/82 and 1982/83. Mr Lai Kew Chai was a Judge of the Supreme Court from July 1981 to 6 February 2006. 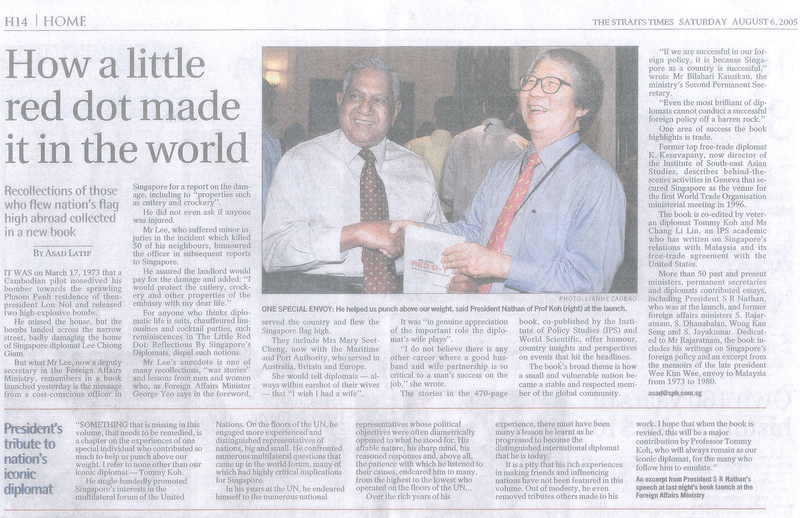 Veteran diplomat Tommy Koh '61 is the co-editor of a newly launched book "The Little Red Dot: Reflections By Singapore's Diplomats"
Law School was saddened to learn of the death of Datuk Salmah Abdul Rahman '73, who passed away on 1 June 2005. Datuk Salmah, who was formerly the Commissioner of Law Revision and Reform at the Attorney-General's Chambers, was sworn in as a judicial commissioner on 27 July 2004, serving at the Civil High Court of Kuala Lumpur for three months before moving to the Criminal High Court in November 2004. After graduating from the then University of Singapore in 1973, Datuk Salmah became a magistrate in Johor Baru. She then served as Sessions Court judge in Johor Baru, Kuala Lumpur and Petaling Jaya, and legal adviser and senior federal counsel in several ministries. She also served as deputy director of the Legal Aid Bureau. 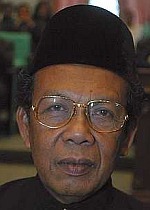 Datuk Salmah was the advisory board chairman in the Prime Minister's Department in Malaysia, before becoming Commissioner for Law Revision in 2000. When the division was expanded to include Law Reform in 2002, she became its first head. She was responsible for the first official Bahasa Malaysia version of the Federal Constitution. She leaves husband Dr Mohd Yusof Mohd Said,and three sons, Shahril, 29, Azlan, 24 and Iskandar, 23. Class of '96 raising S$10,000 to dedicate Law School foyer bench in memory of Edlyn Yap. 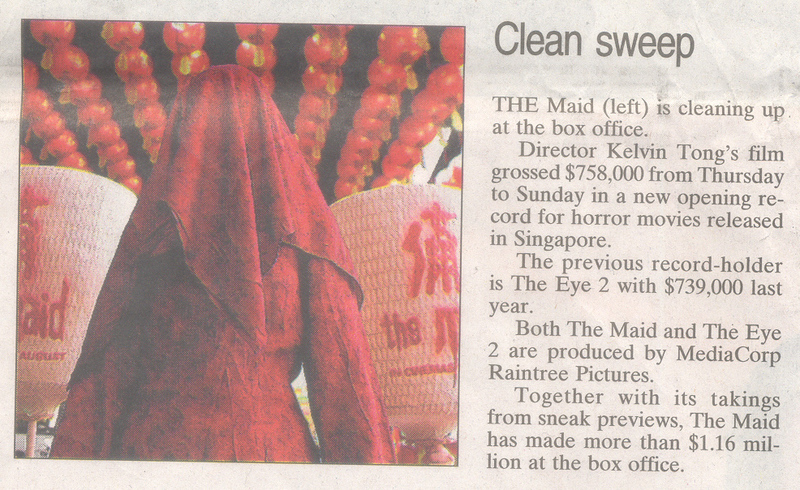 The Straits Times [Friday, April 29, 2005] article. If you would like to contribute, please contact Adeline Ang '96 at adeline@nus.edu.sg; tel: (65) 6874-3683.
which have devastated so much of this region. Edlyn was holidaying in Beruwela on the south-west coast of Sri Lanka over the Christmas season, and was among those killed when the tsunamis struck Sri Lanka. A bubbly and vivacious person, well loved by all who knew her, she will be particularly remembered in Law School for her infectious enthusiasm in various Law Club activities during her years as a student here from 1992 to 1996. From her first week in Law School, Edlyn was a whirlwind of activity – she was part of her freshman Rag & Flag Committee, and stayed involved in Orientation and Law Camp committees every year till she graduated. She was also part of the production and fund-raising team for her Law 4 concert which raised money for charity. Edlyn practised law in Singapore for a few years, before moving to Hong Kong. She was working in Hong Kong as a lawyer and editor of a legal journal. She will be greatly missed by the law school community. Speaks to the Financial Times about "Singaporean" art. Low Sze Wee '95: art curator with the Singapore Art Museum. "Cultivating a love for art". The brainy beauty queen who excels in law too. Patrick Wee '89, the son of former Chief Justice Wee Chong Jin has built a mini yoga empire. An archive of 200 digitally scanned manuscripts by Singapore writers, like our very own Eleanor Wong '85, is now available online for free. Rani Singam '94 is one of Singapore's six jazz divas. Our hearty congratulations to Dr Andrew Phang Boon Leong SC '82, who was appointed a Judicial Commissioner of the Supreme Court in a ceremony 3 January 2005. Law School alumni remember his inspiring and challenging lectures and tutorials, especially in the areas of Contract Law and Jurisprudence, during his time here as a lecturer at the Law Faculty. 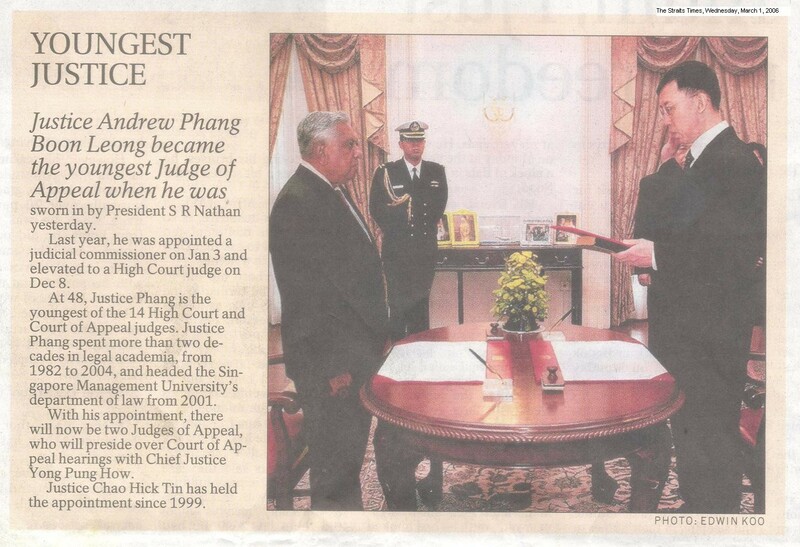 Judicial Commissioner Phang graduated with First Class Honours from NUS Law School, and was also awarded the Adrian Clark Memorial Medal. 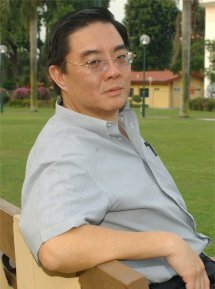 In 1999 he was made a full Professor of Law at NUS, and was also the recipient of an Outstanding University Researcher Award. He was appointed Senior Counsel in 2004, together with our own Dean, Prof Tan Cheng Han SC '87. He has published extensively in Singapore and overseas. He is the author of several books and over 100 articles in legal journals worldwide; and is probably best-known as the author of the Singapore and Malaysia edition of Cheshire Fifoot and Furmston's Law of Contract – the 'bible' of many a first-year Contract student. Congratulations to Judge Khoo Oon Soo '73 and Judge Hui Choon Kuen (DipSing) '96, who were appointed District Judges on 1 December 2004. 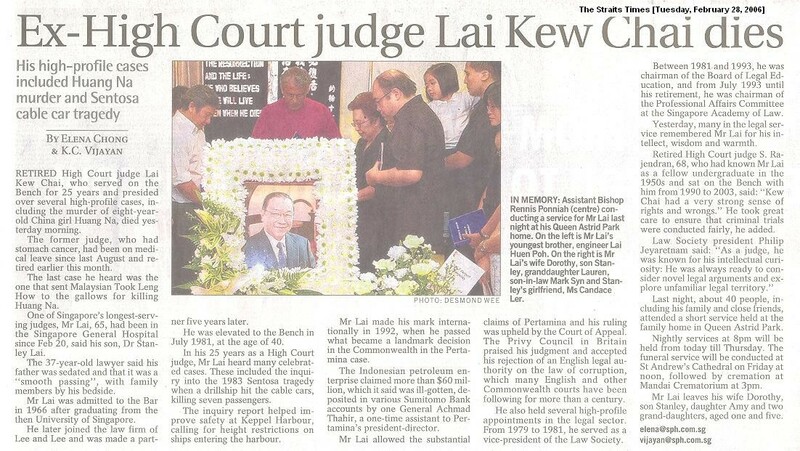 Between 1973 and 2001, Judge Khoo was Deputy Registrar of the Supreme Court and was District Judge and Group Manager in the Subordinate Courts. From 2001, he was Senior State Counsel, Criminal Justice Division in the Attorney-General's Chambers. Judge Hui was a Justices' law clerk in the Supreme Court in 1998, and was then appointed Assistant Registrar from 1999 to 2000. From 2001, he was a Deputy Public Prosecutor with the Criminal Justice Division of the Attorney-General's Chambers. In a ceremony on 16 November 2004, sprightly women's rights activist Anamah Tan '63 she was declared NTUC FairPrice Active Senior Citizen of the Year. In August 2004, Dr Tan became the first Singaporean to be elected to the United Nations' Committee on the Elimination of Discrimination Against Women (CEDAW); she is also a committee member of the United Nations Development Fund for Women (UNIFEM), Singapore Chapter, which works towards women's empowerment and gender equality. Four of our very own Law School alumni were recently featured in the Straits Times as potential leaders from the post-1965 generation, in an article entitled "50 young Singaporeans to watch". Sean Francois La'Brooy '99, Daren Shiau '96, Lee Eng Beng '92 and our very own Law School Dean Tan Cheng Han SC '87 were selected by the Straits Times as young "Singaporeans from which future Cabinet ministers and permanent secretaries might be drawn". Aside from being Dean of the Law Faculty, Cheng Han is also the Vice-President of the Singapore Academy of Law, and Governor of the Intellectual Property Academy. Eng Beng, formerly a lecturer at the Faculty, is now head of the Business Finance and Insolvency practice at Rajah & Tann. Daren is head of the Anti-Trust and Competition practice at Allen & Gledhill, and was awarded the Singapore Youth Award in 2000 for his community service, and the 2001 Commonwealth Youth Program Asia Award for Excellence in Youth Work. Sean is the youngest-ever elected member of the Council of the Law Society of Singapore, and is very active in the Law Society's pro bono activities. Congratulations to Justice V K Rajah '82 on his appointment to the position of Judge of the High Court under Article 95 of the Constitution, with effect from 1 November 2004. Justice Rajah was appointed a Judicial Commissioner in January 2004, and before that was the managing partner of M/s Rajah & Tann. He was among the first batch of lawyers in Singapore to be appointed Senior Counsel in 1997. Justice Rajah is married to fellow Law School alumnus Vathani '88, and they have 2 daughters, Meera and Maya. The Chief Justice has appointed Justice V K Rajah '82 to hear arbitration matters brought before the High Court. Justice Rajah '82 and Justice Belinda Ang, who was appointed with him, join Justice Judith Prakash '74, who was appointed in April 2003 to hear arbitration matters. NUS Law School congratulates Prof S Jayakumar '63 on his appointment to the post of Deputy Prime Minister and reappointment to the post of Minister for Law in the new Cabinet which takes office from 12 August 2004. Prof Jayakumar will chair a Cabinet Committee on foreign policy matters which cut across different ministries. He will also remain in charge of foreign policy issues which involve legal negotiation or international adjudication. Prof Jayakumar taught at the Law Faculty from 1963 to 1971, and also served as Sub-Dean and Vice-Dean for a number of years. He was then appointed Singapore's Ambassador to the United Nations in 1971. He returned to become Dean of the Law Faculty from 1974 to 1980 before entering politics. The law school also congratulates Associate Professor Ho Peng Kee '79, a former Vice-Dean at the Law Faculty, on his re-appointment as Senior Minister of State for Law and Home Affairs. Judge Abdul Hamid Mohamed was elevated to the bench of the Federal Court of Malaysia on 1 August 2003. He graduated from the University of Singapore Law School (the predecessor of our present Law School) in 1969. After graduation, he joined the Malaysian Legal and Judicial Service. He served as Magistrate in Perlis and Perak, President of the Sessions Court in Kedah and Selangor, Assistant Directon of Legal Aid in Kedah and Perlis, Deputy Registrar of High Court Malaya, State Legal Adviser in Kelantan and Perak, Senior Federal Counsel of the Inland Revenue Department and Head of Prosecution at the Attorney General's Chambers of Malaysia. On 1 May 1990 Judge Abdul Hamid was appointed a Judicial Commissioner and served at the High Court in Penang. 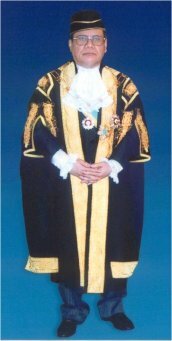 On 1 March 1992 he was appointed a High Court Judge; and continued to serve in Penang until October 1999 when he was transferred to Kuala Lumpur. On 1 September 2000 Judge Abdul Hamid was appointed a Judge of the Court of Appeal of Malaysia. From 1 August 2003, Judge Abdul Hamid serves on the Federal Court; which is the highest Court in Malaysia. Tan Sri Ahmad Fairuz Sheikh Abdul Halim '67 was appointed Chief Justice of the Federal Court of Malaysia on 17 March 2003, succeeding Tun Mohamed Dzaiddin Abdullah. Tan Sri Ahmad Fairuz received his letter of appointment from the Malaysian Yang di-Pertuan Agong, Tuanku Syed Sirajuddin Syed Putra Jamalullail at a ceremony at Istana Negara on 17 March. Tan Sri Ahmad Fairuz's career in the Malaysian judicial service started when he was posted as a magistrate in Penang. Tan Sri Ahmad Fairuz has also served in important positions such as the Legal Adviser of Kedah/Perlis, Johor and Selangor, Official Assignee of Malaysia, Chairman of the Advisory Panel in the Prime Minister's Department and Special Commissioner of Income Tax. He was appointed a Judicial Commissioner in 1988 and a High Court Judge two years later. He was promoted to Court of Appeal Judge on 1 December 1995, Federal Court Judge on 1 September 2000 and a year later as Chief Justice of Malaya. He became president of the Court of Appeal on 1 December 2002, and in a fitting culmination to his legal career, is now occupying the highest judicial office in Malaysia. Ong Keng Yong '79 assumed the role of Secretary-General of the Association of South East Asian Nations on 1 January 2003. Prior to his appointment, Keng Yong had been the Chief Executive Director of the People's Association and the Press Secretary to Prime Minister Goh Chok Tong. Keng Yong has also held numerous diplomatic and public service appointments, including High Commissioner to India and Ambassador to Nepal. Alumni Choo Han Teck '79, Woo Bih Li '77 and Tay Yong Kwang '81 were appointed High Court Judges on 1 January 2003. All three Justices were previously Judicial Commissioners in the High Court of Singapore.